The proposed Mountain Rescue Aspen building and 45-foot training tower would be located on the site of the former Planted Earth garden center just upvalley of the Aspen Airport Business Center. The height of the peak of the roof of the proposed building is 34-feet high. A majority of the Pitkin County commissioners on Wednesday said they were OK with a new 34-foot-tall building for Mountain Rescue Aspen in the location of the former Planted Earth garden center, but the board is not comfortable with a 45-foot-tall training tower the nonprofit organization also wants to erect. The control tower at the Aspen airport, further downvalley and on the other side of Highway 82 from the location, is 47 feet high. The training tower needs to be 45 feet tall to allow for proper rope training exercises, said Jeffrey Edelson, the operations director of Mountain Rescue Aspen (MRA) who has been designing the project. 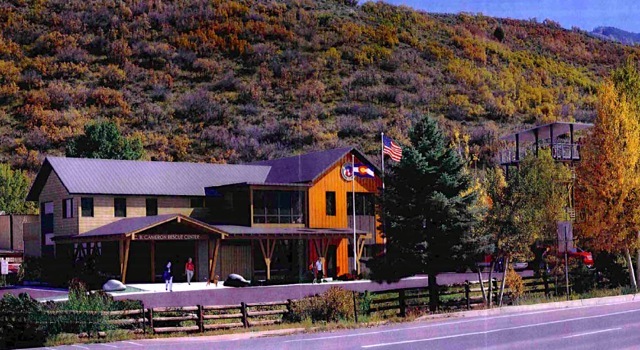 A rendering prepared by Mountain Rescue Aspen that shows its proposed building and training tower after proposed landscaping has grown out. He added that other premiere rescue teams in Colorado have had training towers to work with. However, the proposed tower would visually break a ridge line, which conflicts with the county’s scenic view plane guidelines, according to county staff’s memo reviewing the land use application. The tower also conflicts with the 2012 Aspen Area Community Plan and the draft West of Maroon Plan, which currently says structures in the area should be kept low to avoid urbanizing the highway corridor. The commissioners continued first reading of MRA’s land-use application until Feb. 27, and several commissioners suggested that architect Charles Cunniffe explore moving the training tower back from the main building’s front left corner and see if the roof of the tower could be made less prominent. Earlier in the meeting Cunniffe suggested the commissioners try and look at the height of the building and the tower as a positive. And he pointed out that the tower is not a solid building, but instead has an internal staircase surrounded by four pillars and a semi-enclosed platform on top. MRA is an all-volunteer organization that functions as an arm of the Pitkin County Sheriff’s Office, which has legal responsibility for search and rescue operations in the county. MRA only deploys under the direction of Pitkin County Sheriff Joe DiSalvo, who told the commissioners that the new building would be a valuable asset that his department and other public safety officials could use in emergencies. The 13,750-square-foot building includes a 65-person meeting room, rooms that can be wired for use as a second county communications center, lockers for volunteers and their gear, bunk rooms for post-rescue rest, and 6,000 feet of garage space for MRA’s mix of trucks, trailers, ATVs and snowmobiles. The Mountain Rescue Aspen Charitable Trust bought the 1-acre lot next to the ProBuild building materials center in December from Bill Hawkins for $1.6 million. The trust has since signed a 100-year lease with MRA. The trust is controlled by the Cameron family of Oklahoma. In 1977, MRA responded to a plane crash in the Capitol Creek valley that killed one family member and wounded four others. The land is a gift from the grateful family and is designed to be a big step up from MRA’s cramped 3,500- square-foot cabin on Main Street. The review process for MRA hit a snag recently when Hawkins, the seller of the Planted Earth property, began salvaging portions of his former building without a proper demolition permit from the county. County code prevents the commissioners from approving a land-use application that has been “red-tagged,” as the Planted Earth building has been, until the violation is cured. In this case, the code requires that MRA secure a demolition permit before gaining approval from the county for the new building, which can be time consuming. MRA officials, who want to build this spring, urged the commissioners to move forward and approve the project at first reading on Wednesday. But the board took the legal advice of Chris Seldin, the assistant county attorney, who recommend waiting to until the land-use violation was resolved before even approving the building on first reading.